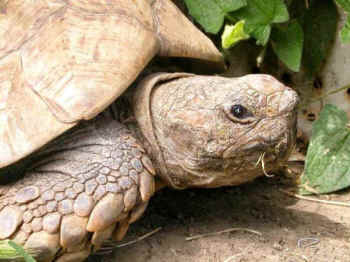 A cantankerous huge old Leopard tortoise, Rosie came to American Tortoise Rescue in September 1998 from a confiscation by West LA Animal Shelter. She was among 17 turtles and tortoise that belonged to another tortoise rescuer, Roy Lewis. He was in failing health, and sadly stopped feeding his animals. The shelter called us and after trying to help him care for them, the shelter personnel said that's enough, he must relinquish them to you. He did, after we promised that he could some and visit any time. He never did. Rosie is dead. She passed away while sunning herself on one of Malibu's glorious warm January days. She gave me a warning a few days before that she was not well. Nothing monumental, but knowing her as well as I did, I could see that something was not right, and I said to Marshall, "Rosie is dying." A cantankerous huge old Leopard tortoise, she came to American Tortoise Rescue in September 1998 from a confiscation by West LA Animal Shelter. She was among 17 turtles and tortoise that belonged to another tortoise rescuer, Roy Lewis. He was in failing health, and sadly stopped feeding his animals. The shelter called us and after trying to help him care for them, the shelter personnel said that's enough, he must relinquish them to you. He did, after we promised that he could some and visit any time. He never did. It must have been sad for Roy, but all 17 animals were starving, sick and looked as if they might die. We had our work cut out for us, but I laughed when I went back though the intake forms this week and found Rosie's. It said hungry and "agitated." Ha! Rosie was always angry, withdrawn and definitely agitated unless I sat down next to her in the leopard yard and gave her a massage. She spoke to me in a way that no other tortoise has ever done before or since. I loved that big old girl, and I truly believe that she loved me - Marshall and I used to laugh and call her a frozen turkey. She was the same size and weight. I'd pick her up in her old age and put her in a special tub of water for a soak, and then I would feed her separately so she would always get to eat because the other guys would try to steal her food. She even got to be evacuated once in a fire - she must have hated that! We communicated in a silent, loving way, and she loved her back rubs. She didn't like anyone but me. She would stomp away when we had visitors to hole up in her house. Once when an animal photographer came to take her photo for a book on very old animals - Rosie was at least 80 and maybe even more than a hundred years old - she refused to cooperate. She kept her head in her shell, and then would start running away whenever she had the chance. After four hours of coaxing, the photographer gave up. No picture ever appeared. I guess she just felt it was time to go over the Rainbow Bridge even though I did not want her to go. But tortoises are very stubborn. She had a rich full life, an ocean view, loving back rubs and two people who cared about her so very much. I will never forget you, Rosie. You were a silent, but loving old girl. You brought me hours of pleasure and helped me learn so much about the special and incredible bonds we can have with animals. Bye bye, old girl. I will see you again when I, too, cross the rainbow bridge. American Tortoise Rescue (ATR) is a nonprofit501(c) (3) corporation founded 22 years ago to provide for the protection of all species of tortoise and turtle. We offer permanent sanctuary to abandoned and lost tortoises that cannot be adopted because of ill health and they remain in the care of American Tortoise Rescue for the remainder of their lives. ATR has saved more than 3000 turtles and tortoises since its inception. Visit the website to donate in Rosie's name.